Well, that was 15 minutes wasted! So, success on the 4-letter front, but I needed other entries to help fix their places. I started on the clues in order. I found a lot of them fairly forgiving, although they needed careful attention. And so, 1½ hours later I had finished my first pass through the clues… I think the longest I have ever taken. However, it was very rewarding, with just over two dozen solved. With YULAN from clue 12, I tried IYNX and UNIT in the top left leaving OAST and FRIS for the bottom right, possibly linked by SERAI. If ELTON and NITRIC went in at the top, that gave I•E•U… for 1dn and I finally tried INEQUALITIES — M[a]IN – M + QUALITIES with E inside. This completed Answer for the first word of the guidance spelt out by extra wordplay letters. 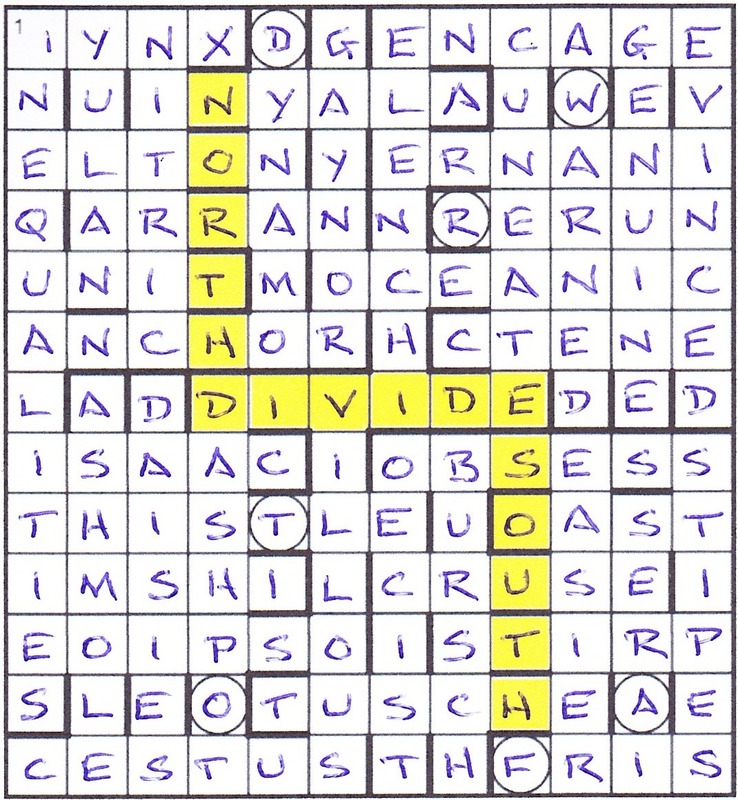 Now ISAAC, THISTLE, IMSHI and EO IPSO could be slotted in at bottom left and the grid had a basic structure with which to slot in other entries and solve the remaining clues. The last two I solved were 19b Sulphur absorbed in small quantity primarily enhances substance used in printing (6) for TUSCHE where •USC•E looked like MUSCLE for ages, and 4b Father embracing older relative rejected Don Juan in the end (6) where ERNANI revealed himself to be Don Juan in Verdi’s opera. The best surface readings for me were 7b Initially locked out, Israeli wrecked unfurnished inn (5) for SERAI and 15a Disgusting tail of llama’s left covered with long, soft hairs (7) for VILLA[n]OUS – A (also very late in being solved). The extra wordplay letters now spelt out Answers containing N to the top and S to the bottom. This even applied to 1dn. Full marks if you noticed that while filling in the grid. [I’ll do the marking. Ed.] I wrote down the circled letters DWRTOFA, and my first doodle of an anagram gave me FORDTAW and WATFORD looked the likely word. Watford is a small village in Northamptonshire with Watford Gap close by. Through the Gap runs the M1 Motorway, the West Coast Main Line and the Grand Union Canal. It is often considered to be the border between the North and South of England, the so-called NORTH-SOUTH DIVIDE with their associated INEQUALITIES. I guess the Rockies are considered the East-West divide in the USA. Great fun, thanks Kruger. Not an easy solve (about 3½ hours, I think), but very entertaining and a marvellous grid construction. This entry was posted on 14 April 2017 at 4:00 pm	and is filed under Solving Blogs. Tagged: Kruger, Not The Rockies. You can follow any responses to this entry through the RSS 2.0 feed. You can leave a response, or trackback from your own site.